Medical costs for people aren’t the only healthcare costs rising. Veterinary care for our pets is rising too. Not only can large veterinary bills strain a household budget, but they can also force us into making tough choices. Do we go ahead with a life-saving surgery for our beloved pet, or do we decide that the cost is simply too high? We don’t have to make such choices when it comes to people. After all there’s health insurance, and even if you can afford it, there’s the Hippocratic Oath that requires that you be given at least life-saving medical treatment even if you can’t afford it. But what do you do if you’re faced with a large medical bill for your pet, and don’t have the money to pay for it? And perhaps more important, what do you do keep yourself out of a situation that may require you to make such a difficult choice? There are at least three ways that you can deal with medical costs for your pet, but the catch is that you need to do something about it right now – before you have the need. On the upside, there is no network of providers – they will cover services with any licensed veterinarian. There are also no limits on benefit payments, or on the number of claims that you file (according to the company’s website). If the idea of having health insurance on your pet doesn’t appeal to you, you can also set up a dedicated savings account that you can use to handle unanticipated healthcare costs. We’ve already seen the how the insurance policy costs in the neighborhood of $600 per year. But should you decide to go without health insurance, you can put an equivalent amount of money into a dedicated savings account for your pet. This will be a form of self-insurance, so that you’ll have the money available when needed. The advantage of this method is that if you don’t spend money, you can keep it and use it for other purposes. In fact, over the course of your pet’s lifetime, it could be a significant amount of money. For example, if you save $600 per year for 15 years, you’ll have $9,000 saved – plus interest. Of course, this assumes that your pet will be completely healthy during that time, and never have need for medical attention. Either way, it would give you complete control over the money that you have allocated and budgeted for potential medical expenses. The downside of using the savings method is in timing. Let’s say that your pet needs to have a certain procedure will cost $2,000. But you only had your pet for two years, and in that time you saved up $1,200. You’ll still need an additional $800 to cover the medical costs. Still another limitation is the fact that medical treatment costs for your pet can easily exceed the amount of money that you have set aside for that purpose. Much will depend upon how much you are prepared to spend on any given procedure that you might have done to your pet. Care Credit is actually a trade name for a credit line program that is offered by GE Capital Bank. They have made this program available to healthcare providers so that patients can use the line to cover the deductible portion of a medical procedure. The most attractive benefit of this program – other than having a ready credit-line available specifically for healthcare purposes – is that it comes with an interest-free payback period, that can extend as long as 24 months. That makes it “as good as cash,” particularly when you don’t have the cash. Of course, it’s always best to have money saved in advance of contingencies, but a credit line like Care Credit is the next best thing. We had a line with Care Credit that we got as a result of my wife’s shoulder surgery about a year and a half ago. A couple of months ago, I got a promotional email from Care Credit that had some language referring to veterinary care buried in the fine print. I called the company to verify this to be true, and it was. Then I called our vet to see if they participate in the plan, and they do. You don’t want to use a credit line like this for routine veterinary care, but it can come in handy if you have a major expense, such as a surgery or multiple treatments. 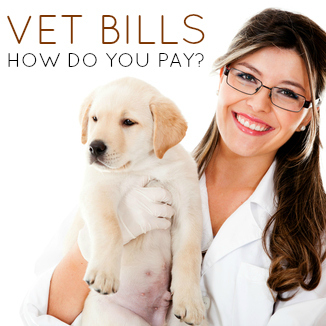 It’s one more option that you have to pay your medical bills for your pet. And best of all, unlike pet health insurance, you can use Care Credit to cover expenses on any type of pet that you have – including ones like our pet rats. What is your contingency plan in case your pet needs high-cost medical treatment? Leave a comment!